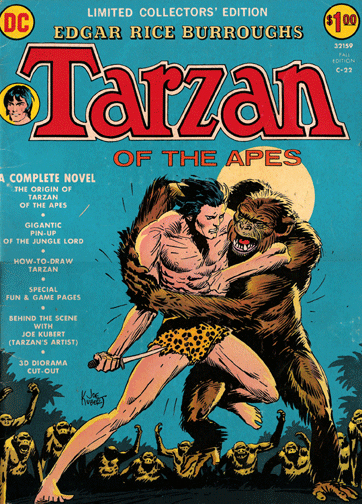 Original cover by Joe Kubert; 1973. Mauro Ferrero's website is here. I love your style, and I like the minimalism a lot. I think it could have been a stronger piece if you had included the other apes, and even the white text on the left, as the large empty space on the left in your piece draws the eye away from the action a bit. But overall I really dig it. It has a nice European feel. Reminds me a bit of Kerascoët. 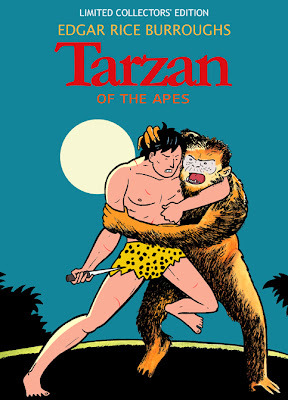 What I think with this one is that this is about 30 minutes prior to the original - that ape has Tarzan in his death grip and won't let go - Tarzan hesitates to use his blade and so they've reached a stalemate. After a while the other apes begin to show up to cheer on their mate. Eventually the ape will break his hold, he and Tarzan will gaze at each other with mutual respect and slowly back away from each other into the jungle. The other apes are greatly disappointed.